Sir Peter Pears was born in Farnham, in 1910. He was a famous tenor and organist, and studied at the Royal College of Music. Many of Britten's works have parts specifically written for Pears, including Peter Grimes. Pears was the co-librettist for A Midsummer Night's Dream. He was knighted in 1978, and died in Aldeburgh in 1986. Britten first met Pears in 1934, when Pears was a member of the BBC Singers. They did not become strong friends until a friend of Pears, Peter Burra, died in an air crash. 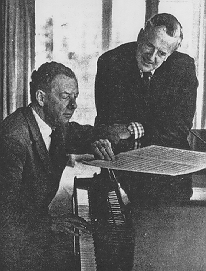 Britten and Pears gave their first recital together in 1937, at Balliol College, Oxford. The concert was part of a Spanish Civil War relief program. As mentioned in the biography page, Britten traveled with Pears to America. Their return home was marked by a performance of the Michelangelo Sonnets at Wigmore Hall. Its success led EMI to record it, which marked Pears and Britten's first recording together. The following information about Britten is adapted from the "Peter Pears" section of Alan Blyth's Remembering Britten. Britten and Pears played very well together during recitals (Britten played the piano). Britten often got nervous before performances, especially during his later years. He would tend to "freeze" up, which he thought impaired his performance, but once he got into the performance he would lose this fear. Britten was an accomplished conductor; he worked well with the English Chamber Orchestra. This was partially due to his belief in efficient rehearsals. He required the musicians to pay attention, and would be somewhat harsh if someone was inattentive. This helped him focus on the music more. He understood that there existed other interpretations of his works, but often disliked second performances, especially when they weren't faithful to his original intentions. One good example of this was Tony Guthrie's production of Peter Grimes that had sea covering three-fourths of the stage; this caused the performers to be crowded into a small area. Britten wrote pieces for specific people (e.g. Pears) and so the singer's personality was especially important. He would cast the singers before actually writing the piece. Brahms: In his younger days, Britten liked Brahms, but then reacted against his music. Mozart, Schubert: "loved without qualification." Bach, Dowland, Purcell: Britten "liked" them. Mahler: Britten learned to appreciate Mahler after hearing his Fifth Symphony. He went to a concert to hear a "fashionable" concerto, expecting to be bored by the preceding Mahler symphony, but it turned out to be the other way around. Tchaikovsky, Debussy, Ravel: Britten liked them, especially for their skill in orchestration. Stravinsky: Britten liked his early works, but didn't like the Paris "chic air" that was associated with his later works. Shostakovich: Britten was friends with him, and loved his works. Britten was generally religious, in that he acknowledged the existence of a higher power, but he was not a regular churchgoer. However, he did have a "low church" puritanical attitude. He had a strong conscience, sense of honor, and standards. He did not easily forgive people who violated his moral standards. "I think the key to his music lies in his moral point of view combined with his craving for lost innocence brought on by his increasing disillusionment with man"